Rod 4mm X 4", 6", 8", 12"
Rod 4 mm X 4", 6",8", 12"
Trocar tip at one end for easy insertion. We are manufacturer and supplier of orthopedic tubular fixator and devices like steinman pins, schanz screw, orthopedic clamps, denham pin and tubular fixation instrument set from mumbai. 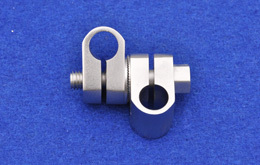 We also export orthopedic tubular clamps, external fixation instrument set, etc across the world.